This cauliflower salad with shrimp is surprisingly delicious and simple to make. We guarantee the unique flavor combination will be a huge hit at any potluck or bbq that you make this for! Bonus: you can make this cauliflower salad well ahead of time and store it in the fridge because you serve it chilled! When Debbie first told me about this cauliflower salad I was like, “What? 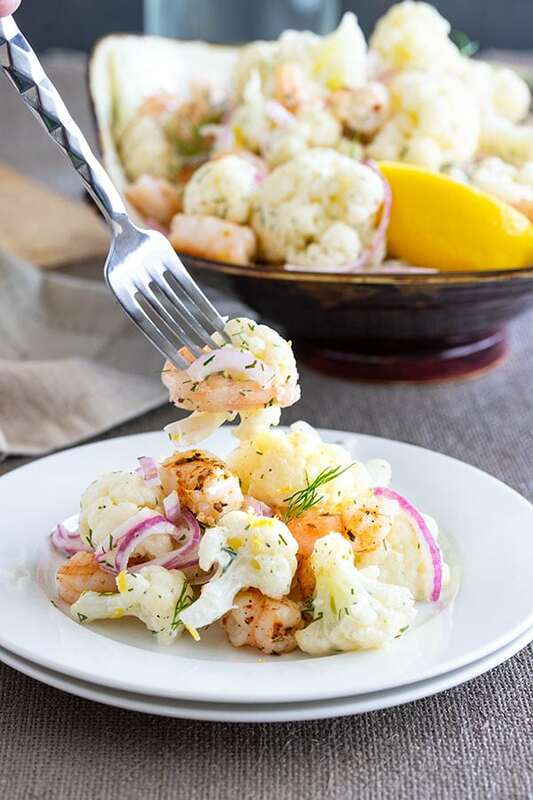 Cauliflower and shrimp? 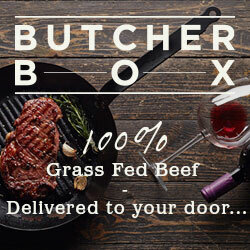 Really?” but I was sold on my first bite. I also couldn’t believe how simple the recipe is! Easy , healthy, tastes great. Perfect! The dill really stands out in this salad so it just smells and tastes so fresh! We love it. What goes in a cauliflower salad? I think I might try bacon and green onions next! Bacon is good on everything right? 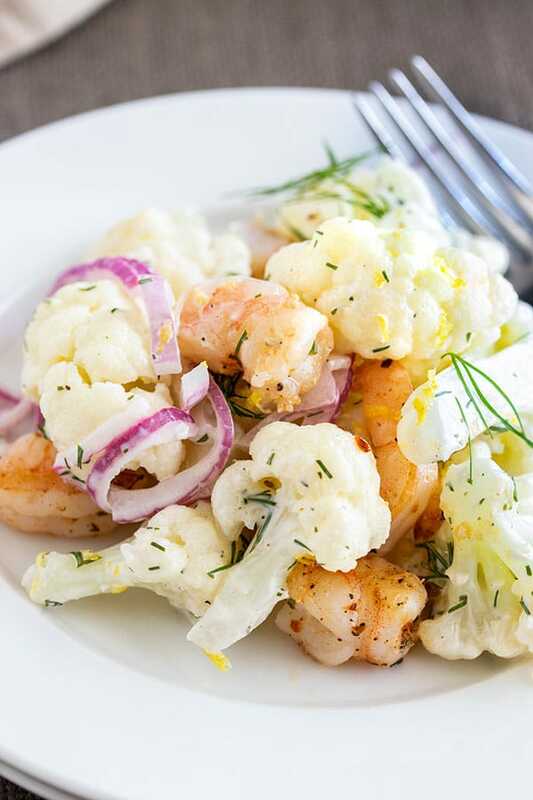 Do you need to cook the cauliflower and shrimp for this salad? The shrimp needs to be cooked and you can either buy it pre-cooked in a bag or a can, or cook it yourself. We sauteed ours in a hot pan for a couple mins. The cauliflower needs to be blanched which means basically dipped in boiling water and then dipped in freezing water. It’s just to take a little crunch out of the cauliflower, not to fully cook it. wash and cut up your cauliflower. Peel and devein your shrimp. add the cauliflower to a little bit of boiling water in the bottom of a pot and steam for 4 mins or until they are just barely fork tender. Drain the cauliflower and drop them into a bowl of ice water to stop the cooking process. Then drain well. toss the shrimp in a little cajun spice and saute in a hot skillet for a couple mins until they turn pink. add the cauliflower, shrimp and onions, to a bowl. make the dressing in a small bowl and mix it up well. pour the dressing over the salad and mix gently until it is all covered in the dressing. You can serve it right away or you can cover it and throw it in the fridge until you are ready to serve. don’t over cook the cauliflower. Just a couple mins in the pot is plenty. Its better to have the cauliflower under cooked than overcooked because you don’t want it mushy. when you drop the cauliflower in the ice bath, don’t leave it in there too long. Just enough for it to get cooled down and stop cooking on the inside. Then pull it out and drain it so the water drips off and drys. You don’t want wet cauliflower in your salad. you don’t have to use a cajun spice or any spice on the shrimp. We have had it without and its still really really good. 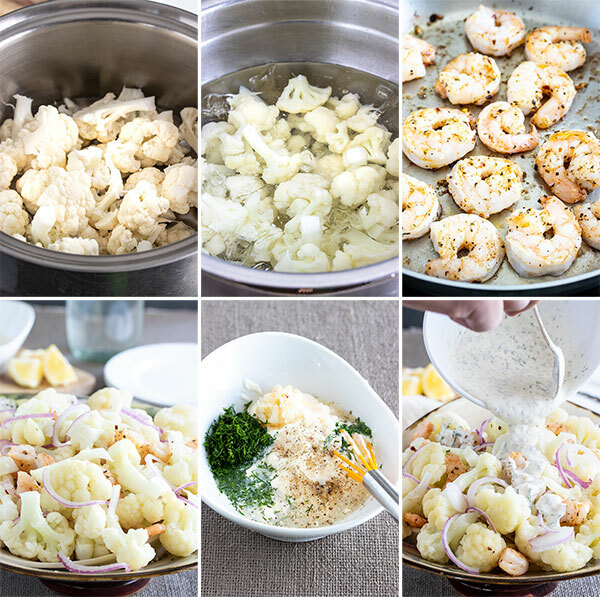 I know that the cauliflower/shrimp combination is sort of unusual, but trust us… Give it a try and I bet you will love it too! perfect pan fried salmon – the best salmon EVA! 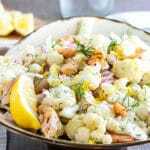 If you’ve tried this cauliflower salad recipe then don’t forget to rate the recipe and let us know how it turned out in the comments below. We love hearing from you! 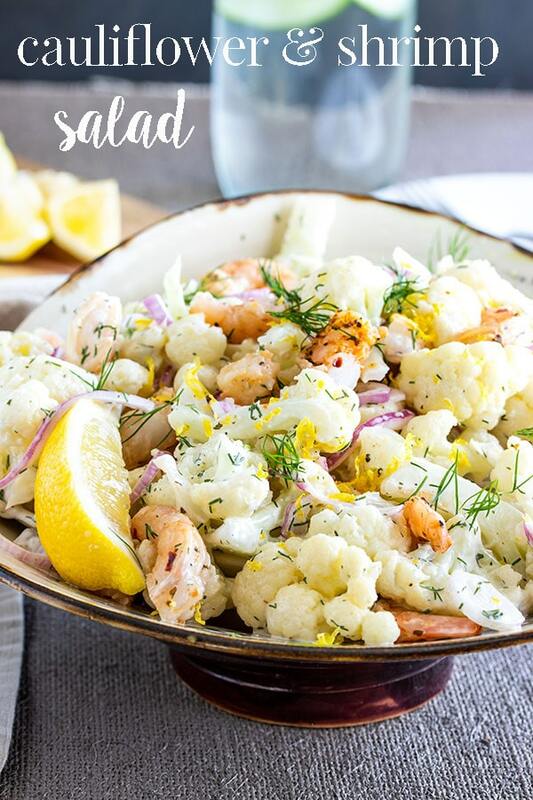 This cauliflower salad with shrimp is surprisingly delicious and simple to make with only five ingredients. We guarantee the unique flavor combination will be a huge hit at any potluck or bbq that you make this for! Bonus: you can make this cauliflower salad well ahead of time because you serve it chilled! Cut your cauliflower into bite sized pieces and wash well. Rinse your shrimp and set aside. Add the cauliflower to a pot of shallow boiling water and blanch for 2 mins or just until it starts to become opaque. Make sure to not over cook! Remove from the heat, drain, and transfer the cauliflower to a bowl of ice water to stop the cooking. Drain and set in the fridge to cool completely. In a small bowl add the mayo, dill, lemon juice and salt and pepper. Stir to combine and set aside. Once the cauliflower has cooled, add the shrimp and the dressing and stir to coat all the cauliflower. You can either serve it right away or keep it in the fridge till you are ready. Thank you SO much! We love hearing that!